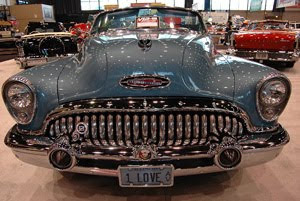 The 48th Annual O’Reilly Auto Parts World of Wheels has a new spring date, March 5-7, 2010, and a new location at the Donald E. Stephens Convention Center (5555 N. River Road, Rosemont, Ill.). This year’s show, presented by Denny Guest's South Oak Dodge-Chrysler-Jeep and produced by Championship Auto Shows, Inc., also promises several new car features. The show is open Friday, March 5, 3 p.m. - 10:30 p.m.; Saturday, March 6, 10 a.m. - 10:30 p.m.; and Sunday, March 7, 10 a.m. - 7 p.m. Admission is $16 per person, $5 for children ages 6-12. Children five and under have no fee. 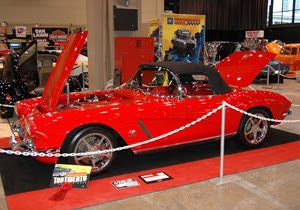 Celebrating its 48th year in showcasing the country’s best custom and restored cars, trucks and motorcycles, the O’Reilly Auto Parts World of Wheels show is the oldest and largest enthusiast event in Chicago. The move to the Donald E. Stephens Convention Center enables the show to continue to grow having 550,000 square feet of exhibition space. The show also has more exhibits, vendors, displays and events, including a live charity auction featuring auto and music memorabilia and showcases. The O’Reilly Auto Parts World of Wheels is a weekend to remember with new features like Drag City USA presenting a unique exhibit of nostalgic dragsters from The Don Garlits Museum of Drag Racing in Ocala, Fla., including Garlits’ personal collection of “swamp rats;” Connie Kalitta’s “Bounty Hunter;” and Don Prudhomme’s 1970 Wynn’s Winder known as “The Snake” which some may remember as a Hot Wheels car. New this year is the Tuner Galleria featuring a collection of the finest European modern muscle and sport compacts paired with live entertainment. Formerly a show in itself, the popular Chevy VetteFest also is a new addition where the ultimate in original and restored Corvettes and Chevrolets compete for the Gold Spinner and Triple Crown Awards. Celebrity appearances are always a popular feature at the O’Reilly Auto Parts World of Wheels. Joining the line up this year includes Chip Foose, legendary auto designer and star of “Overhaulin,” who appears at the show on Saturday, March 6. More auto industry celebrities are also expected at this year’s event. Throughout the weekend, cars compete for the prestigious Legend Cup, sponsored by CleanTools. This award is given to the winning vehicle which best represents a combination of style, quality and craftsmanship during the O’Reilly Auto Parts World of Wheels weekend. The winner of the CleanTools Legend Cup is awarded a beautiful perennial cup and presented with a check for $5,000. O’Reilly Auto Parts World of Wheels also hopes to combine the worlds of auto and art with the Chicago Brushmasters Pinstripers Art Auction. This live charity auction features several hundred professionally decorated pieces from artists around the country. Proceeds benefit the Ronald McDonald House. Committed to educating future generations about the automotive industry, the 5th Annual O’Reilly Auto Parts World of Wheels Student Day is held Friday, March 5 at the Donald E. Stephens Convention Center. Participating students visit the show floor to see the vehicles and speak with sponsors and exhibitors before the event opens to the public, as well as earn complimentary access to all parts of the three-day show. The 48th Annual O’Reilly Auto Parts World of Wheels, presented by Denny Guest's South Oak Dodge-Chrysler-Jeep is produced by Championship Auto Shows, Inc. of Auburn Hills, Mich. Part of the International Show Car Association custom car competition, the show takes place March 5-7, 2010 at Donald E. Stephens Convention Center (5555 N. River Road, Rosemont, Ill.). The event hours are Friday, 3 p.m. to 10:30 p.m., Saturday, 10 a.m. to 10:30 p.m. and Sunday, 10 a.m. to 7 p.m. Discount pre-sale tickets can be purchased at O’Reilly Auto Parts. For more information, visit www.worldofwheels.com.